Welcome to Ho Chi Minh City. You will be welcomed and taken to your meeting point, the Intercontinental Saigon. Please arrive at the hotel by midday. From here travel by coach to My Tho to board the luxurious Scenic Spirit. Toast the start of your cruise with a cocktail reception. Board a sampan to visit Cai Be before stopping at local cottage industries and a French colonial or traditional Vietnamese house. Alternatively savour morning tea at a French colonial house or choose to stay on board for your special Scenic Freechoice activity. Later, immerse yourself in the historic town of Sa Dec and explore and interact with the sellers in the lively market, then visit the home of Mr Huynh Thuy Le who inspired Marguerite Duras’ novel L’Amant. Visit the farmers on Evergreen Island and enjoy a ride in a Xe Loi. Alternatively, walk through Chau Doc market, visit a family-operated fish farm and cruise around Chau Doc waterfront or visit Tra Su Bird Sanctuary. Tonight enjoy a themed evening dinner to say farewell to Vietnam. Arrive early this morning into the capital city of Cambodia, Phnom Penh. Journey to the Killing Fields and tour Tuol Sleng, the former school which was converted to the Khmer Rouge’s main prison, or take a guided tour of the local food market before joining a hands-on Khmer cooking demonstration. Alternatively, explore by Tuk Tuk Phnom Penh’s colonial buildings and the Central Market before lunch at a local NGO restaurant teaching street kids hospitality skills. Arrive in style by Tuk Tuk and immerse yourself in the historically celebrated luxury of Raffles, Hotel Le Royal. Enjoy a guided history tour followed by an indulgent high tea prepared in front of you, all whilst sipping on the hotel’s signature cocktail named in honour of Jacqueline Kennedy. Choose to retire to the Elephant Bar for happy hour before returning to the ship. Later this evening revel in our exclusive Phnom Penh by City Lights tour, giving an insight into the capital’s nightlife. This morning marvel at the Royal Palace, with the famous Silver Pagoda within, on your included visit to this must-see attraction. Later sail up the Tonle River to the silversmith village of Kho Chen. Cruise to Kampong Tralach and take an ox cart ride through a local village and fields to Wat Kampong Tralach. Board your coach to the ancient capital of Oudong to visit the impressive pagoda and monastery. Learn how to pray in a Buddhist pagoda and partake in a ceremony to receive a blessing from a monk, all whilst donating towards the daily meal of the resident nuns and monks. Drive a short distance to Prek K’dam to re-board Scenic Spirit and continue your cruise to Kampong Cham via Phnom Penh. Enjoy a cocktail reception on the sundeck against the backdrop of Phnom Penh’s lights as the ship sails past the capital at sunset. Walk (or drive) to the top of Wat Hanchey, an ancient hilltop pagoda and monastery to meet the resident novice monks. Sail downstream to Kampong Cham. Learn about the history behind Phnom Pros (Man Hill) and Wat Nokor. Alternatively explore the ecotourism village of Cheung Kok or visit a rubber plantation factory and betel nut village. Disembark and discover the countryside of Cambodia on your drive to your Siem Reap where you will transfer to the airport for your onward or homebound flight. Please book your flight to depart after 6pm. Cruise along the Mekong on a luxurious 11 day journey. Discover ancient temples, Angkor Wat & witness the alluring Apsara dancers at an exclusive dinner. 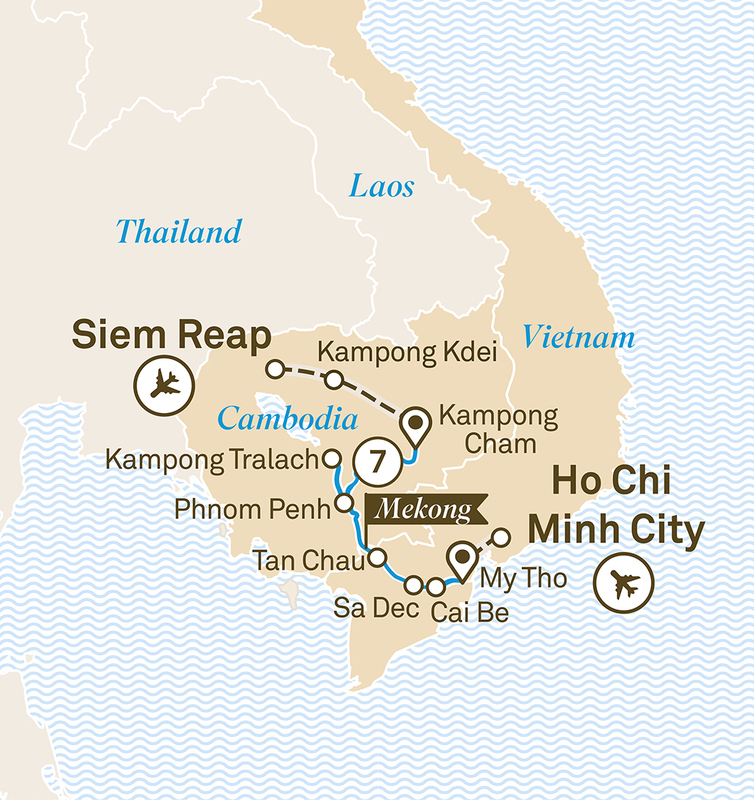 Enjoy a luxurious 13 day journey from Siem Reap to Ho Chi Minh City. Cruise along the mighty Mekong and enjoy an exclusive gala dinner at an Angkor temple.